Surface on a table, anyone? Do you even remember this one? Remember Illumiroom? It was a Microsoft research project that was all about turning your bedroom or lounge into a gaming space, in the most literal sense. We saw it at CES 2013, but dismissed it as one of those quirky ideas that would never appear. Too expensive, too involved, too "out there". As it turns out, Illumiroom isn't dead. It has been reborn as RoomAlive. It uses projectors and Kinect-style sensors to turn your living room into a game environment. Heck, it might even get released in some form one day. But it got us thinking about all those great bits of tech we've seen demoed over the years, the ones that never made it out of the labs and onto the shelves. Join us in having a look through the archives at the tech that never made it. Just about every time one of the top phones comes out, a new iPhone or a Galaxy S-whatever, rumours start circulating that it'll offer super-advanced haptic feedback. It's much more exciting than the vibrate you get with just about every phone. It can make a surface feel as if it has a completely different texture, despite being completely flat. One of the most memorable demos we saw was the Senseg system from 2012. It sends small electrical impulses through your fingers to make like you're feeling various textures on normal glass. Senseg even hinted that its tech might end up in the iPad three years ago, which of course turned out to be total nonsense. While it would almost certainly come across as a total gimmick for the first year or so, this sort of touch could, in theory, enrich our mobile phone (and tablet) lives. Though we still reserve the right to rip it a new one when the Amazon Fire Phone 2 decides to use it as the cornerstone of its sell-in. But it's a pity we're yet to see it in a remotely mainstream device. Will it be back? We haven't heard anything from Senseg in the last couple of years, and its Twitter account has been dormant since 2012. Someone else is going to have to take the baton, and at the moment it's in Fujitsu's hands, after showing off a haptic feedback tablet at MWC 2014. If you think you're excited about virtual reality gaming with Oculus Rift and Project Morpheus you should have seen what it was like back in the 90s. VR was in and it seemed like the future. You could even see representations of it on TV, in the 90s programmes like Gamesmaster and Knightmare when they were still on TV (granted, the latter is actually more green screen than VR). At one point it looked like we were going to get a real VR gaming experience too, with the Sega VR headset for/alongside the Sega Genesis (that's the Megadrive for UK readers). The plan was for it to have its own games, including some that were shown off at CES 1993. 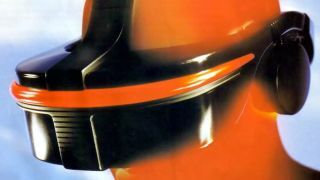 In concept, it was very similar to the headsets we see in development today. It'd put screens in front of your eyes, and used sensors to track you head movements. So what went wrong? The official line at the time was some guff about being worried about gamers' safety, about Sega VR being too realistic. Look back to the kind of graphics games had back in 1991-1994 though, when the being worked on, and you can only conclude they're telling porkies. It seems likely that the Sega VR's LCD displays would be massively headache-and-nausea-inducing. Oculus Rift's LCD prototype caused such issues, and that's with 20 years of extra LCD screen development in the can too. Binning the Sega VR was a sensible move, as Nintendo's Virtual Boy would demonstrate a few years later. Of course, it kind of marked a beginning of the end for Sega. A string of bad decisions meant it would never reach Sega Megadrive heights again. And before anyone says it, yes we know the Dreamcast was quite good. Will it be back? Sega no longer has the corporate ego it had back in the early 90s. Its days of making console hardware are long gone. The closest you'll get is one of those licensed retro Megadrive handhelds. Still, Sega might end up making a VR game whe the Morpheus/Oculus are actually released. No-one cares about 3D anymore, but what if your TV could produce convincing 3D without the need for brightness-killing, crosstalk-causing glasses? Glasses-free 3D has lost some of its lustre since everyone stopped wanting the third dimension in their TV screens, but it's still something we miss hearing about. A bit. We remember many demos from old CES shows, where you had to sit in an exact spot or the image would fracture into a headache hell. Those were most definitely not the days, but we do remember them. The truth is that there are still glasses-free 3D TVs floating about, just not a lot of them. In early 2014, Philips showed-off a Lenticular-based 3D TV, comparable with the Parallax barrier tech used in the Nintendo 3DS. Samsung also showed off a TV at CES 2014, in a 4K glasses-free concept that offers 30-plus positions where you can sit and see the 3D. The one we'd really like to come back to, though, is an MIT project that popped up in 2012 – that of a Holograph projector. It popped up again in 2014 through MIT News, but we're sadly no closer to anything that Samsung or LG is going to snap up. It uses existing LCD technology to produce a holograph-like effect that's quite different from the normal glasses-free 3D we've seen. Its projection-like form of display would, if we've understood it, get rid of the sweet spot issue of other forms of 3D. Will it be back? The Holograph TV is, as far as we know, still being tinkered with. The question is whether it'll ever get out of the pHD lab and make its way into a commercial product. Our guess: not in its current form. Remember Panasonic's Android phones? No? Don't worry, we have trouble remembering too, and we actually tried them out back in 2012. It looked like Panasonic might finally sidle up to HTC and LG in the great struggle to chip a little off Samsung's market share. These phones came with the usual grand launch, followed by not so much as a whimper. We reviewed the Eluga (and didn't like it all that much) but it never actually made it to the shelves of the local phone stores. Panasonic was a bit ahead of its time, in being obsessed with waterproofing. Little has been written about why the Panasonic Eluga range failed to break into the European market, but we assume it may have been as simple as all the networks responding with a resounding "nah, we're good. Thanks, though." Without support from the phone networks, it's impossible for a phone to make it big. Or make it at all. Panasonic Eluga may have been a response to the company's struggles in the TV market. Panasonic was master of plasma TVs from the time Pioneer bowed out the best part of a decade ago, but by 2012 it was clear plasmas were on the way out. Panasonic's share price has actually recovered after a pretty depressing low in late 2012, though, so it must be doing something right. Not making phones (outside Japan) may be part of it. Will it be back? It seems unlikely that Panasonic will resurrect 'Eluga', but it is actually having another stab at the Android phone market. It announced the Panasonic CM1 just the other month at the Photokina conference. It's not jumping in with both feet this time, though. Panasonic wants you to think of the CM1 as a camera that just happens to have woken up one day with the Android OS and the ability to take phone calls. Its 1-inch sensor could make the Panasonic CM1 the best phone camera to date, but we wouldn't be surprised if this one disappears straight into Room 101 like the Eluga. It's one of the most expensive phones around at around 700 Euro (about £552, US$888, AU$1014). Back in the early days of Android, from 2008-2010, everyone was obsessed with putting the operating system into everything. Android in your toaster, Android in your fridge, Android in your… shower curtain? Maybe not that far. The one that has always stuck in the mind, though, was Android in a microwave. We actually saw a few different prototypes of this in action, although, sadly, we're yet to see one of the things in store. Touch Revolution showed off the Android microwave at CES 2010. It was more-or-less a proof of concept. A "look at what we can do, isn't it neat?" cry for help/attention. Looking at it now the Touch Revolution seems quaint, albeit still pretty handsome as microwaves go. So why hasn't the Android dream house become a reality? Well, it was a pretty silly idea, wasn't it? Google has struggled enough with perfecting Android on tablets and phones over the last six years. However, that could change. Android Wear offers a cut-down kind of interface using basic information and basic gestures that would fit in well around the home. Maybe my dream of an Android kettle could come true. No, wait, that was a nightmare. Will it be back? Normal Android on a microwave? Nah, we're done with that fad. However, that Android's ecosystem is going to make its way further into our homes is a dead certainty. Google didn't buy Nest because it thinks the company's thermostat looks cool.